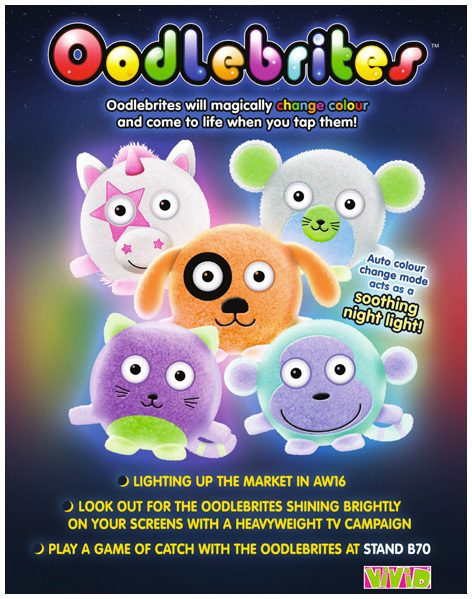 Oodlebrites is a colourful plush range from Vivid. These brilliantly quirky little creatures magically change colour and come to life when you tap them. In addition, the "auto colour change mode" acts as a soothing night-light for younger children. Using the catchphrase ‘Oodlebrights are Lights’, Vivid teamed with Share The Fun to launch the light-up plush range which features five animal characters including a unicorn, cat, dog and monkey. Please tell us what you think of the Oodlebrites by Vivid.